The May 21, 2012 issue of Forbes magazine describes how tech company start-ups acquire information technologies without spending for the acquisition of IT overhead. These firms use commercial cloud services instead of setting up their own data centers. DoD operates over two thousand small applications with annual budgets of less than one million dollars. These applications deal with short-term IT requirements or consist of pilots to demonstrate the feasibility of a computerized solution. The availability of low cost cloud computing solutions has recently become a flood of offerings. Thought should now given to switching to deployments through Infrastructure-as-a-Service (Iaas) for small applications. Later, such approach can be scaled up to multi-billion enterprise programs. New projects need not be encumbered with the burden of elaborate planning, cost justification, development and acquisition of computers as dictated by existing Directives. Instead, DoD should adopt the method for rapidly setting up new projects cheaply and instantly. An experimental system can be tried without much risk and for a small expense. Innovative applications can be tested and even discarded without committing to multi-year expenses. After a new project demonstrates its suitability, it can be always scaled up. 1. There is no need to acquire dedicated servers. A low-cost pool of IaaS servers is readily available so that a customer is purchasing only as-needed machine cycles available from an already standard infrastructure. Purchasing servers can be justified later after the scope of the application justifies a much larger overhead. 2. The cost of data center operating personnel is already included in run-time charges. 3. E-mail and associated Office software will be available for no charges until the scale of operations rises well beyond the original scale. 4. 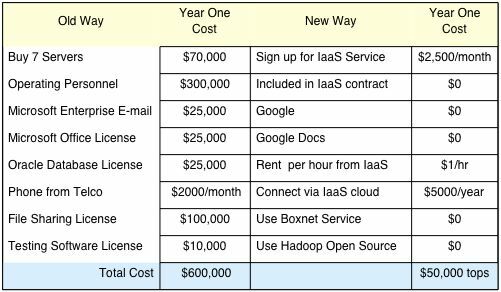 One of the most expensive software licenses is the charge for Oracle databases. That can be rented on a per use basis. 5. Unless security issues are involved, a new application can depend on virtual Internet to establish connectivity to and from the cloud. 6. Setting up a stand-alone application involves many added security software features, usually purchased through licensing. When developing a new application reliance on a wide variety of open source applications should suffice. Initially thrifty computing should be used primarily for applications that do not require stringent security measures. This includes human resource management (FY12 expense of $1.7 billion), administrative and financial management ($1.1 billion), health management ($1 billion) and supply management ($3 billion). Thrifty computing offers an attractive option for immediate cost reductions. Many small-scale applications, already in process of implementation, can be encapsulated for immediate virtual migration to IaaS services, which are readily available as mature and tested environment both as public as well as private offerings. If an IaaS service already includes in its infrastructure elaborate security safeguards, adopting a thrifty approach will deliver not only immediate dollar savings but also significant gains in information assurance.